Every 4-Her who shows a steer at the fair needs to know what happens after the sale. My kids have shown steers for years and for the past couple of years, our steers have gone to a local meat locker and sold to people to put in their private freezers. 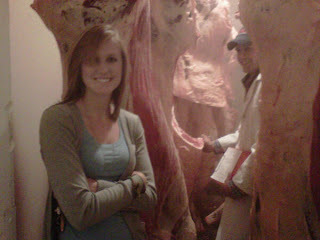 This year, the Extension Office offered a chance to view the carcasses after they were graded. My daughter's Angus steer won Grand Champion Beef Carcass this year. The photo was taken with my phone, so it isn't the "best" quality, but the steer was the best quality: he graded high choice, weighed 734 pounds, had a 13.3 square inch ribeye and a yield grade of 2.3. If you are not familiar with those grades, check out the information at BeefItsWhatsforDinner.com. 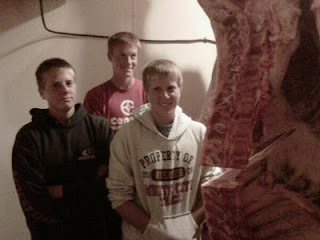 We sell our steers to neighbors and friends to put in their freezers. There are a number of pros and cons to buying beef by the half carcass. Of course, you have great beef always in your freezer and it is some of the highest quality meat available usually--our steers are fed for quality so they always do well. On the negative side, you must pay for about 200 pounds of beef at one time; but remember, by purchasing the entire carcass, you are actually getting it at a much lower price than at the grocery store one package at a time. I am not sure if its a positive or a negative, but you also get to say how you want the meat cut and packaged. Most of the people that we sell to have bought a half a beef before, so they are familiar with the terminology. But many people are not familiar with the various names of cuts and how thick each should be cut or how much to put in a package. If you are unfamiliar with the names of various cuts or would like more information on each cut, check out the Interactive Meat Case here. Many people enjoy buying their beef by the side, and having it in their freezer ready to use at any time. If you are interested, I encourage you to contact a local meat locker and ask if they sell beef (or pork) by the side and if they rent lockers--which may help so you don't have to own a freezer. Also, most local meat lockers will sell you certain cuts of meat and advise you on packaging and even cooking information. Do not be afraid to ask questions--they want to make sure you get what you want! If you have any questions about buying local meat, don't hesitate to ask me. I'll tell you my thoughts and help you find someone in your area. In the meantime, check out these gorgeous ribeye steaks that I had the butcher cut 5/8" thick so they would grill fast and fit on a bun for steak sandwiches! 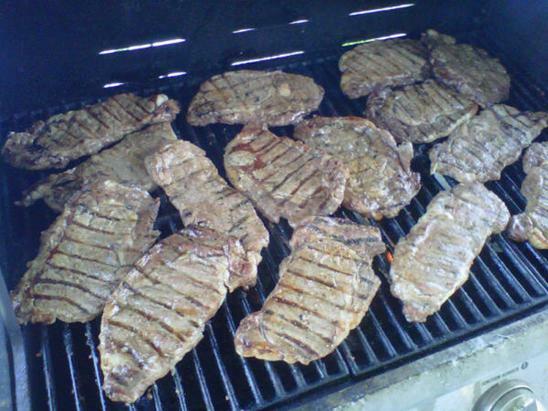 AMAZING cookout for Independence Day 2010! I love this post! The grin on the butchers face is priceless, I am guessing that there aren't too many pretty girls visiting him in the meat locker! Love how your children have a true appreciation of the whole process. Okay, just gotta say, I love that you have pics of carcasses on your blog post today. Love it!